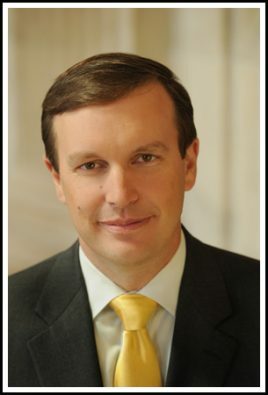 Chris Murphy, the junior United States Senator for Connecticut, has dedicated his career to public service as an advocate for Connecticut families. Senator Murphy has been a strong voice in the Senate fighting for job creation, affordable health care, education, sensible gun laws, and a forward-looking foreign policy. As a member of the Health, Education, Labor and Pensions Committee (HELP) Senator Murphy has worked to make college more affordable and ensure that our public education system works to serve all students. Senator Murphy also led a bipartisan effort to reform our mental health system, working across the aisle to craft the first comprehensive mental health bill in the Senate in decades. Senator Murphy has laid out a forward-thinking foreign policy vision for the United States. As a member of the Foreign Relations Committee, he has been an outspoken proponent of diplomacy, international human rights and the need for clear-eyed American leadership abroad. Following the tragic shooting at Sandy Hook elementary school in 2012, Senator Murphy became one of the leading proponents of commonsense reforms to reduce gun violence. He has championed a number of bipartisan bills aimed at expanding background checks and keeping guns out of the hands of criminals. As a member of the Senate Appropriations Committee, Senator Murphy has fought to increase investments in Connecticut manufacturing and promote procurement of world-class national defense products made in the state. He has fought to expand American manufacturing and create jobs through his Buy American initiative, which urges the U.S. government to spend taxpayer dollars on American-made goods. Additionally, Senator Murphy has worked in partnership with local city and town leaders to rehabilitate former brownfields and factory sites so that they can be developed into new community spaces and businesses. Prior to his election to the U.S. Senate, Murphy served Connecticut’s Fifth Congressional District for three terms in the U.S. House of Representatives. During his time in the House, Murphy worked to improve access to housing for homeless veterans, foster job creation and advocate for affordable healthcare for all Americans. Murphy authored the Frank Melville Supportive Housing Investment Act to revitalize housing programs for people with disabilities. The bill was signed into law by the president in 2010. Before getting elected to Congress, Murphy served for eight years in the Connecticut General Assembly where he was the author of the state’s historic stem cell investment legislation and the state’s workplace smoking ban. Senator Murphy grew up in Wethersfield, Connecticut, and attended Williams College in Massachusetts. He graduated from the University of Connecticut School of Law and practiced real estate and banking law with the firm of Ruben, Johnson & Morgan in Hartford, Connecticut. He is married to Catherine Holahan, an attorney. They have two young sons, Owen and Rider, and a cat, Ramona.